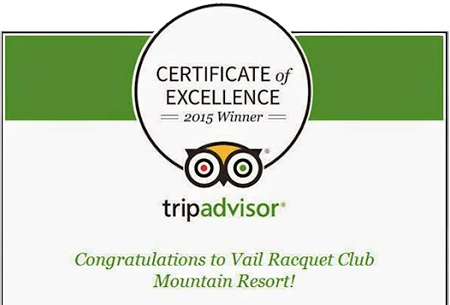 The Vail Racquet Club Mountain Resort is the largest Resort property in the Vail Valley with over 20 scenic acres nestled in quiet East Vail. We offer unique outdoor ceremony sites that even the most particular of wedding guests will marvel at. Even more, the site is yours for the day so don’t fret about planning the time details now! 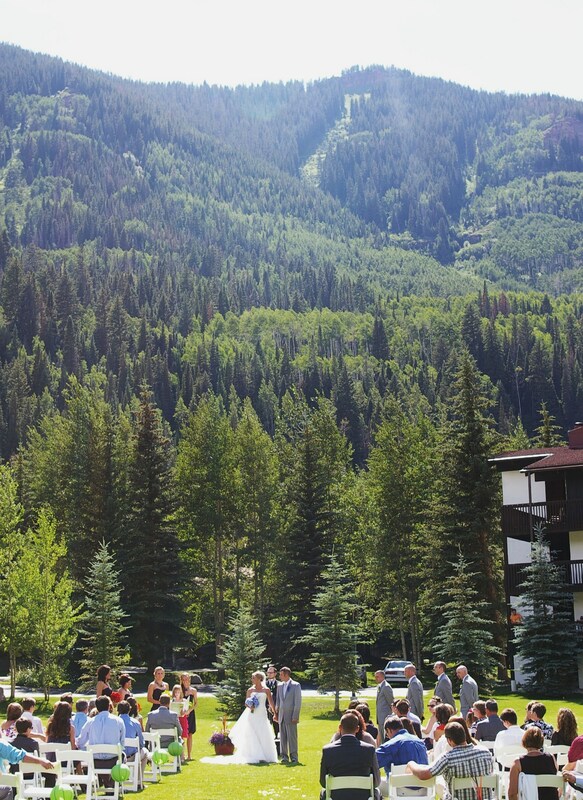 Additionally, when contracting with the Vail Racquet Club Mountain Resort, you do not have to commit to any one location because your wedding will be the only one on property. Once you start planning and have developed your vision fully, you can then decide which space suits your big day best. Still want to know more? See our Resources page for inclusions and what to expect for your best day ever! For available dates for the upcoming wedding season see our calendar at the bottom of this page. Our Royal Elk Room and expansive Royal Elk Terrace overlook the park and beautiful resort grounds from an elevated view. The Royal Elk Terrace has the perfect mountain view making it a fantastic spot for ceremonies, receptions, rehearsal dinners, cocktail parties or a Sunday brunch. No need to decide between the terrace or the Elk room, they come as a set with one low fee! The Royal Elk Room seats a max of 64 guests and the terrace area can host your party for up to 130 guests with a tent rental. Ask your Group Sales & Events Manager for more information or see our Resource Guide here. 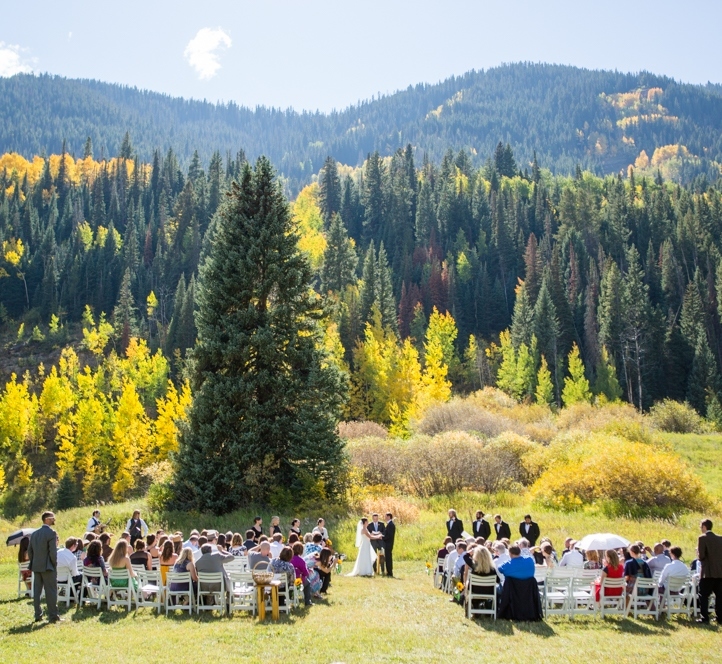 The Mountain Side Meadow is an ideal location for small, private ceremonies set among the mountainside pine and aspen groves. Spring events have the added up-close view of the flowing East Vail Falls. This space is meant for guests who crave a natural environment for their ceremony, without added décor. The meadow is not a groomed area, but a meadow, pure and simple! Currently this space has a maximum guest attendance of 75. Ask your Group Sales & Events Manager for details or see our Resource Guide here. * Plans for the Meadow cannot be guaranteed. Once contracted, if for some reason this area becomes unavailable, the Park or Terrace will be available for your use. 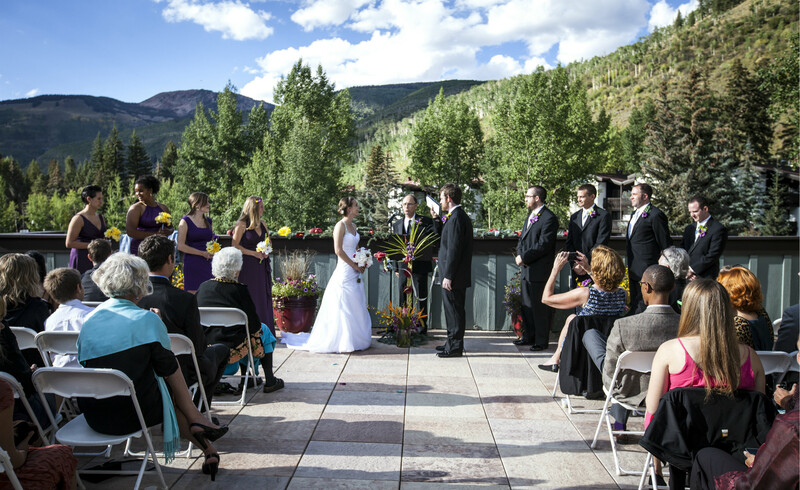 The Vail Racquet Club Mountain Resort creates a picturesque backdrop for your park ceremony where mountain peaks and the lush resort grounds surround you and your guests. This flat 17,000 square foot area is the center piece of the amazing 20 acre grounds and begs to be used as a showcase! Adjacent to the park is the flag stone patio and BBQ area for pre or post socializing with your family and friends. Be sure to borrow the yard games for guests to have additional time in the sun while you and your wedding party take an array of stunning photos! More Information on the park area can be seen here. For more information about on site weddings, see our resource guide here or contact our Group Sales & Events Manager. For available dates for the upcoming wedding season see our calendar at the bottom of this page.